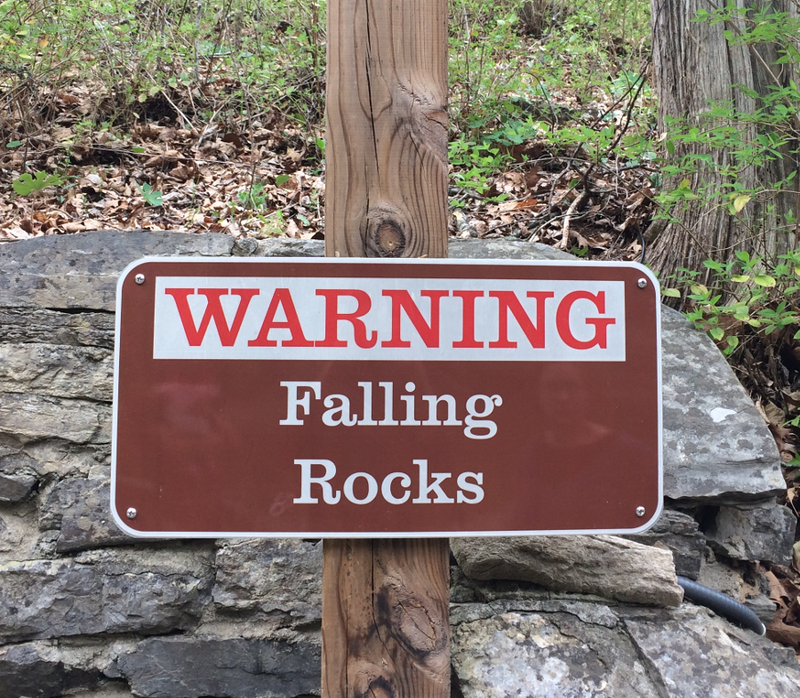 Natural Bridge is a geological rarity, and one of Virginia's earliest tourist attractions. 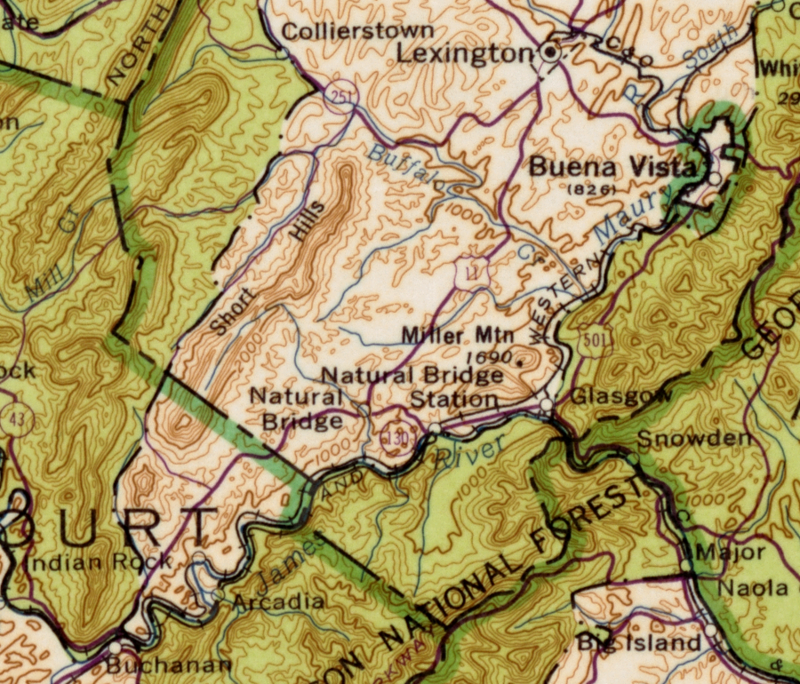 Rockbridge County, created in 1778, was named after the natural bridge. 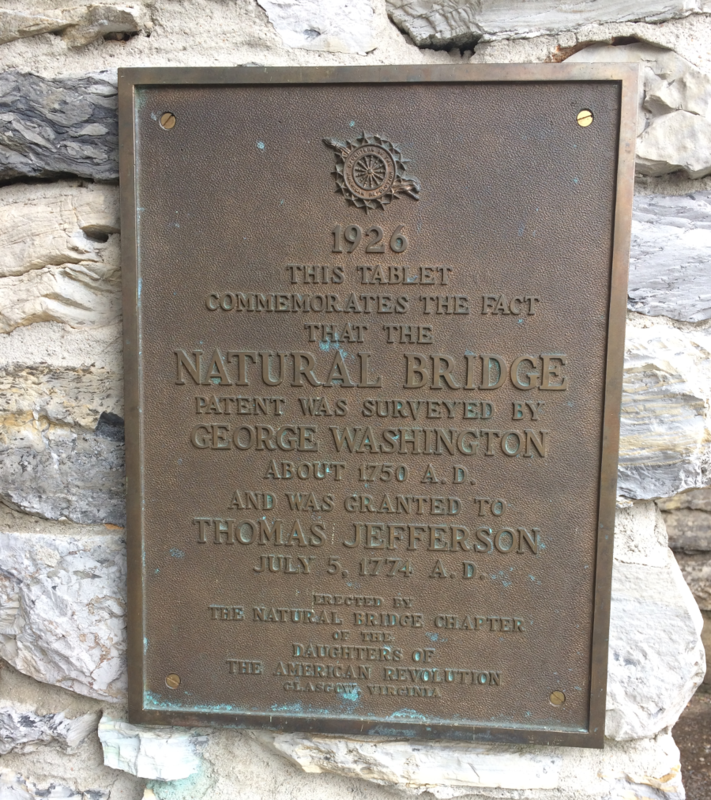 Natural Bridge stayed in private ownership after that 1774 purchase. There were numerous proposals since at least the 1940's for the state or Federal government to purchase Natural Bridge and to preserve it in a park, ensuring public access through public ownership. The _Natural bridge_, the most sublime of Nature's works, though not comprehended under the present head, must not be pretermitted. It is on the ascent of a hill, which seems to have been cloven through its length by some great convulsion. The fissure, just at the bridge, is, by some admeasurements, 270 feet deep, by others only 205. It is about 45 feet wide at the bottom, and 90 feet at the top; this of course determines the length of the bridge, and its height from the water. Its breadth in the middle, is about 60 feet, but more at the ends, and the thickness of the mass at the summit of the arch, about 40 feet. A part of this thickness is constituted by a coat of earth, which gives growth to many large trees. The residue, with the hill on both sides, is one solid rock of lime-stone. The arch approaches the Semi-elliptical form; but the larger axis of the ellipsis, which would be the cord of the arch, is many times longer than the transverse. Though the sides of this bridge are provided in some parts with a parapet of fixed rocks, yet few men have resolution to walk to them and look over into the abyss. You involuntarily fall on your hands and feet, creep to the parapet and peep over it. Looking down from this height about a minute, gave me a violent head ach. If the view from the top be painful and intolerable, that from below is delightful in an equal extreme. It is impossible for the emotions arising from the sublime, to be felt beyond what they are here: so beautiful an arch, so elevated, so light, and springing as it were up to heaven, the rapture of the spectator is really indescribable! The fissure continuing narrow, deep, and streight for a considerable distance above and below the bridge, opens a short but very pleasing view of the North mountain on one side, and Blue ridge on the other, at the distance each of them of about five miles. This bridge is in the county of Rock bridge, to which it has given name, and affords a public and commodious passage over a valley, which cannot be crossed elsewhere for a considerable distance. The stream passing under it is called Cedar creek. It is a water of James river, and sufficient in the driest seasons to turn a grist-mill, though its fountain is not more than two miles above. The private company that owned Natural Bridge until 2014 developed the site as a commercial tourist attraction, along with Natural Bridge Caverns. To draw 160,000 visitors annually to pay the admission fee and purchase souvenirs at the gift shop, including 65,000 who stayed at the Natural Bridge hotel, the company added additional attractions - Professor Cline's Haunted Monster Museum, a wax museum, Dinosaur Kingdom, and a replica of a Monacan village staffed by Native Americans from that nearby tribe. 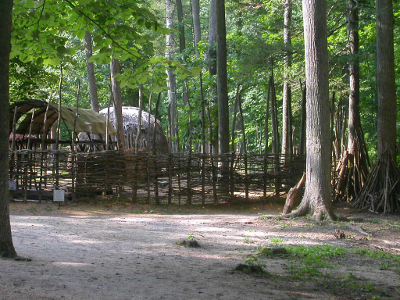 Legend holds that young George Washington surveyed the Natural Bridge site for Lord Fairfax. Landmarks remain of the work and on the wall of the bridge where he carved his initials. 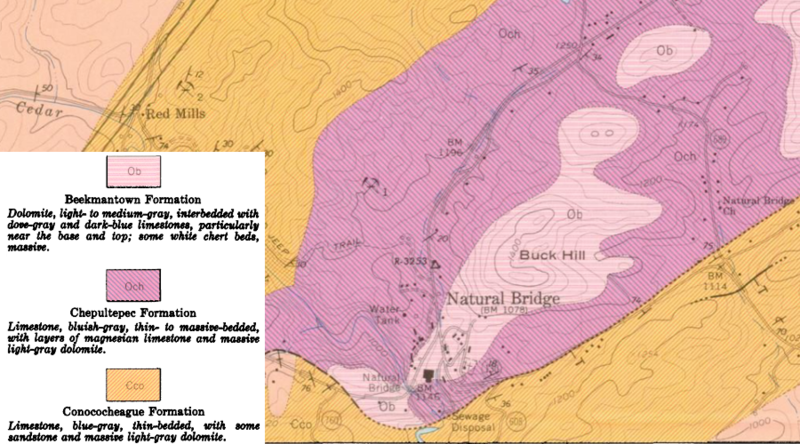 Source: Woltz & Associates, Inc.
no evidence has ever surfaced showing that Washington surveyed the Natural Bridge or any other land in the area. Other myths about the site involve ghost sightings, Monacan Indians discovering a magical "Bridge of the Gods" providing a path across Cedar Creek when fleeing from Shawnee warriors, an arbor vitae tree supposedly 1,500 years old when it died in 1980. In another invocation of George Washington, he is reported to have thrown a dollar over the bridge. That would require tossing a coin 190 feet high, and of course throwing away good money. Since the settling of America, Natural Bridge has served as one of the nation's most recognizable icons of the wonders of nature. Its image was popularized by artists throughout the centuries and by a stream of illustrious visitors who waxed eloquent on its inspiring characteristics. 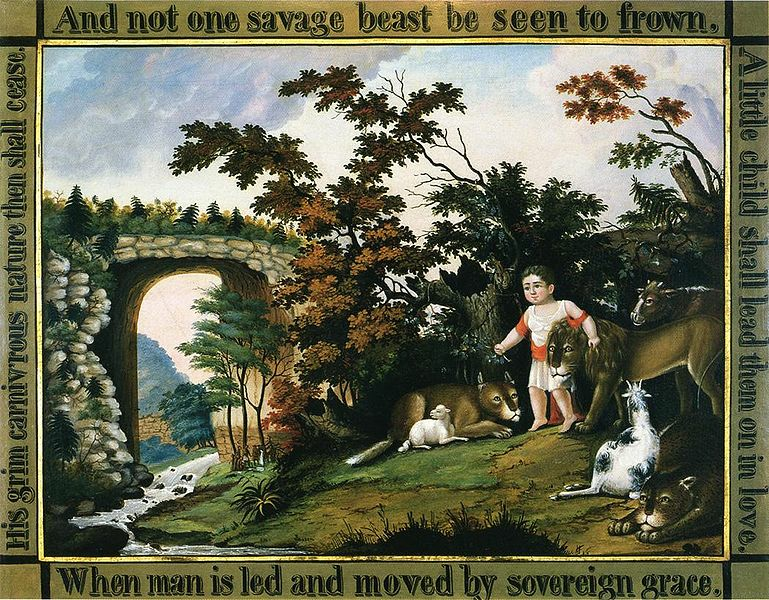 The bridge so captured the attention of Thomas Jefferson that he purchased the site, obtaining a grant from George III in 1774, and later wrote that he considered the bridge a public trust and would not allow it to be injured, defaced, or masked from public view. Indeed, Natural Bridge and Niagara Falls in the late eighteenth and early nineteenth centuries occupied the top tier as the most impressive natural wonders in the New World. The size and geological rarity of the bridge makes the site significant, independent of the cultural history and myths about the tourist attraction. 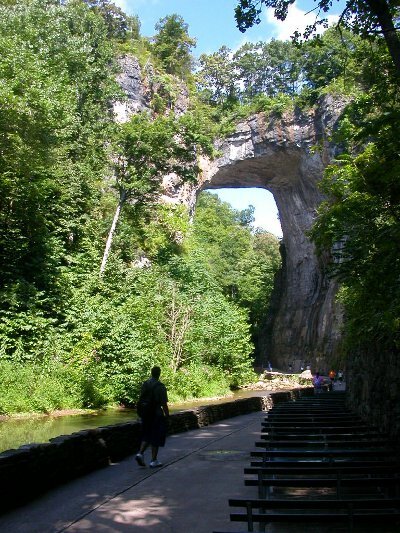 There is only one other natural bridge in Virginia, a much-smaller arch located in Lee County. Natural Bridge in Rockbridge County is a remnant of a cave roof that collapsed. It was not formed by an earthquake that split the land surface, though earthquakes may have cracked portions of the cave roof and triggered rockfalls. 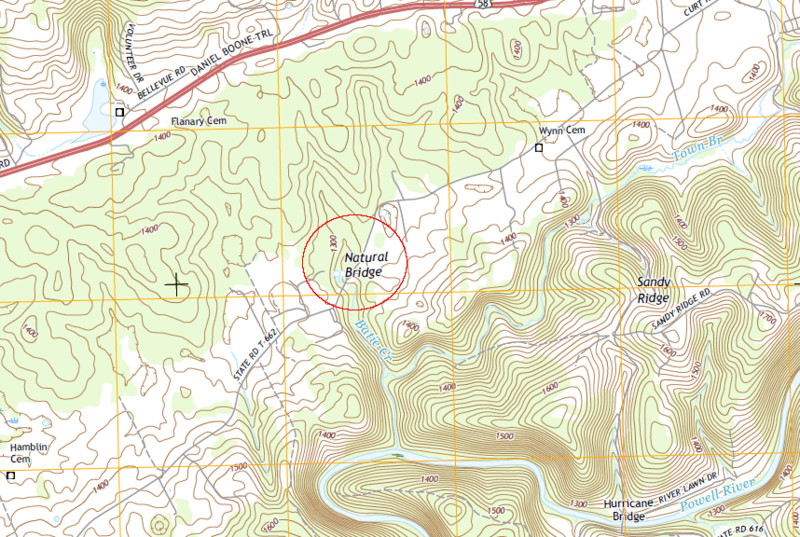 The safe answer to the question "how old is Natural Bridge" is that it was formed a long time ago. The rock itself was deposited around 450 million years ago, when the edge of the continental plate was under the Sauk Sea. During the Ordovician period, a thick accumulation of limestone developed on the ocean bottom as marine plankton and larger creatures with calcium-rich shells died. In later collisions of tectonic plates, the limestone was buried by other sediments and shoved around. Magnesium in the groundwater joined with the calcium to convert the limestone into dolomite, with a chemical composition of CaMg(CO3)2. The bridge itself is much younger, and may have developed only in the last 500,000-1,000,000 years. As rainwater seeped underground, it absorbed carbon dioxide and became slightly acidic. The CO(sub>2 was added as the water traveled through the organic litter on the surface and the A horizon of the soil, which are filled with decomposing humus and animal life exhaling carbon dioxide. 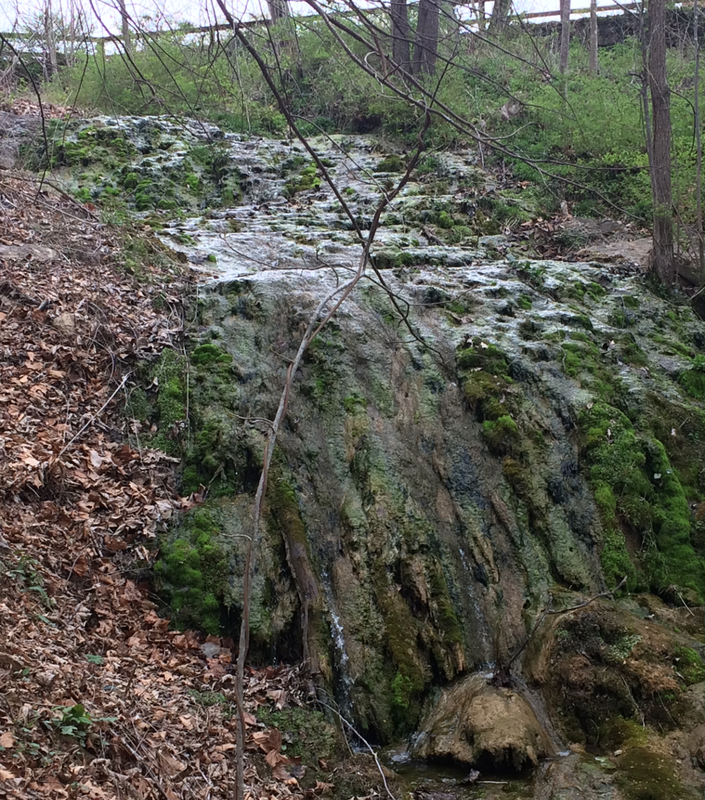 The water became slightly acidic as it trickled down through the topsoil into the dolomite. The slightly-acidic water dissolved some of the calcium carbonate crystals. The groundwater carried away the calcium and carbonate ions in solution, replacing a crystal of solid rock with an empty space. As water dissolved many crystals over time, pores developed in the rock. Portions became similar to a sponge. Where there were cracks in the bedrock, even more water could move underground to create channels connecting the pores. After many centuries, enough rock was removed for a cave to form underground. 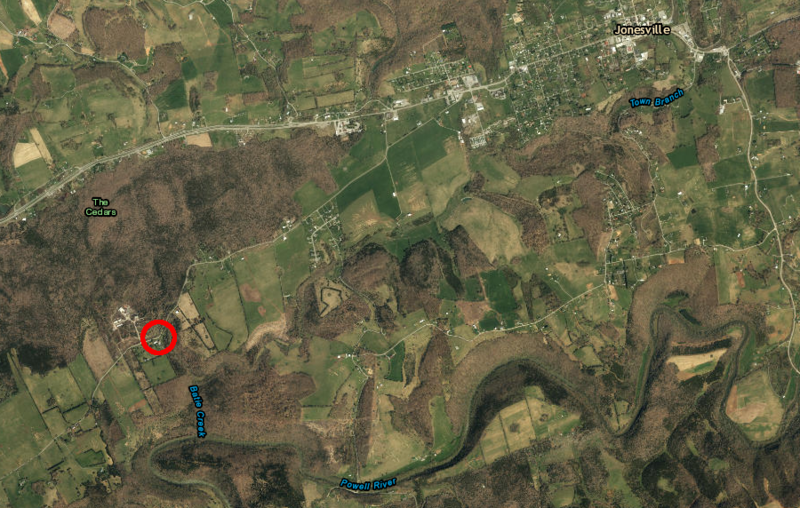 The "hole in the ground" expanded until it stretched west of Cedar Creek and intersected Pogue Run, near modern I-81. The roof of the underground channel that diverted the headwaters of Pogue Run was near the surface. Sinkholes probably formed above the channel, and ultimately "windows" developed where portions of the underground cave were exposed directly to the surface. Surface water that used to flow down Pogue Run was diverted, and instead flowed through the underground limestone channel to Cedar Creek. This act of "stream piracy" changed the watershed divide on the surface. 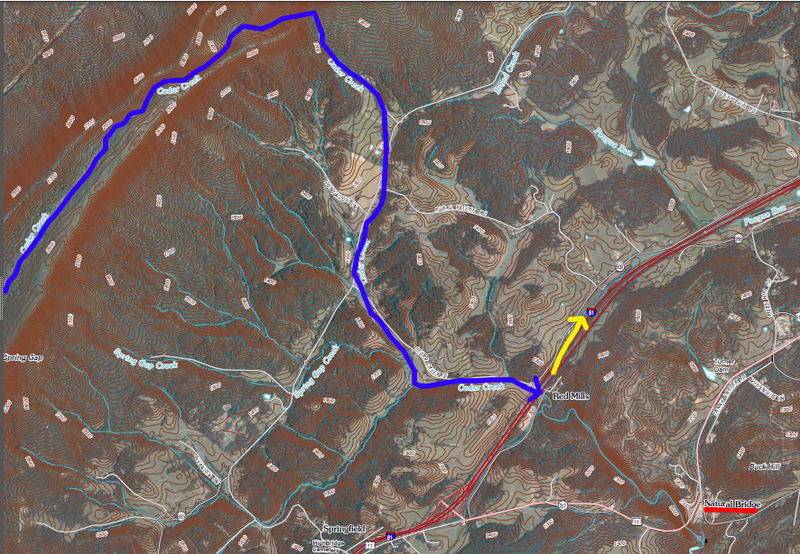 The length of Pogue Run was truncated, and its former headwaters became part of Cedar Creek. the entire opening formed in one cataclysmic event when the back of a huge cave collapsed in 263 AD. Calcium-saturated water that emerges at the surface is making tufa deposits in the streambed. 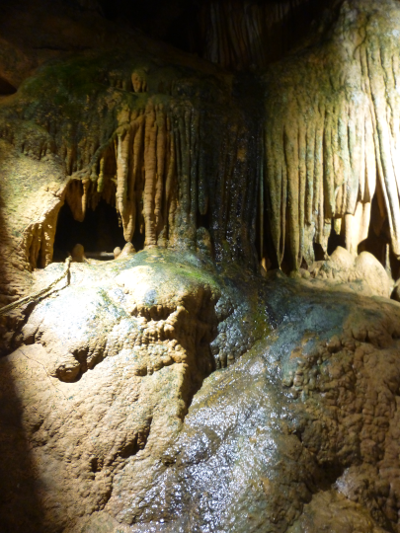 The deposition process resembles the way cave formations such as stalactites and stalagmites are growing in nearby Natural Bridge Caverns. Today Natural Bridge is stable, but it is still collapsing. Inevitably, over geologic time, the remaining portion of the ancient cave roof will collapse into the creek. On October 23, 1999, a 6'x1' slab of dolomite spalled off the bottom of the arch, along with a shower of smaller rocks. One of the smaller rocks hit near a tourist from Georgia reading a plaque beneath the bridge, and debris from that falling rock killed her. To prevent a repeat, loose rock was scraped away from the bridge. Holes were drilled from the top to the bottom, steel cables connected to metal plates installed on the bottom of the rock arch, and the cables were pulled tight. The plates on the bottom of Natural Bridge were camouflaged with paint to maintain the natural appearance. 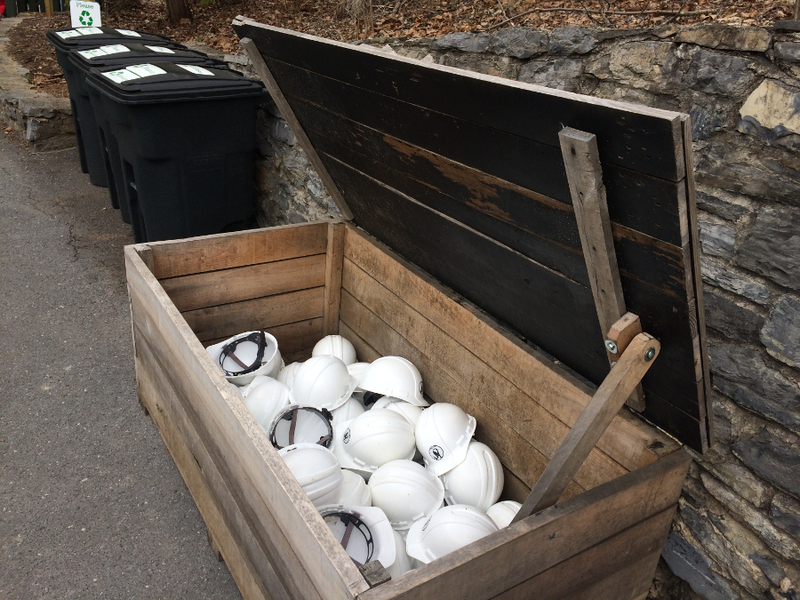 Hard hats are available for visitors to wear, if they are concerned about a repeat rockfall. A hat might not provide any value if a slab landed directly on someone's head, but could reduce harm from rock shrapnel if a piece fell and shattered near a tourist again. Bolting together the rock layers was intended to reduce the chance of another rock peeling loose and dropping onto the trail below the bridge. The cabling also mitigated the effect of vibrations from traffic on Route 11. Native American trails crossed Cedar Creek on the arch for thousands of years, and there has been a road across Natural Bridge since 1753. Route 11 was constructed across it in the 1930's, and in 2017 the state estimated 2,000 vehicles/day traveled on top of Natural Bridge. Only 5% were trucks, and since 2000 there has been a 20-ton weight limit on them. 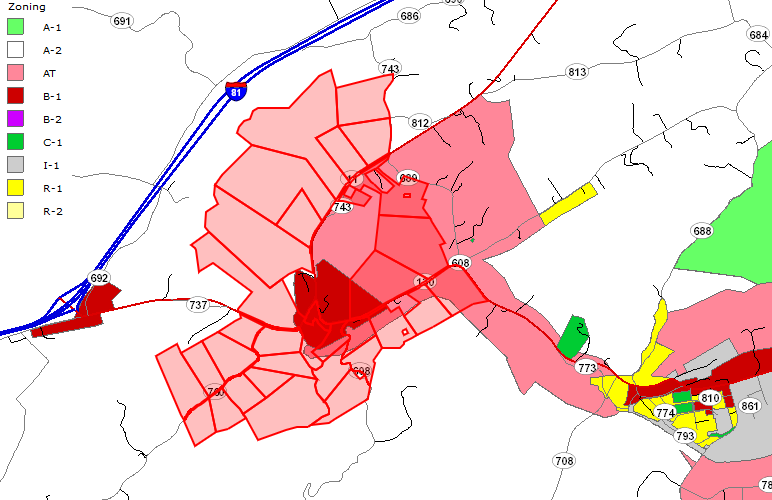 However, that limit is waived when traffic must be diverted from I-81 due to an accident. The effect of 2,000 vehicles crossing the bridge each day is not clear. The natural structure is so large that engineers have assumed it could handle the weight of vehicles and whatever shaking they might stimulate. 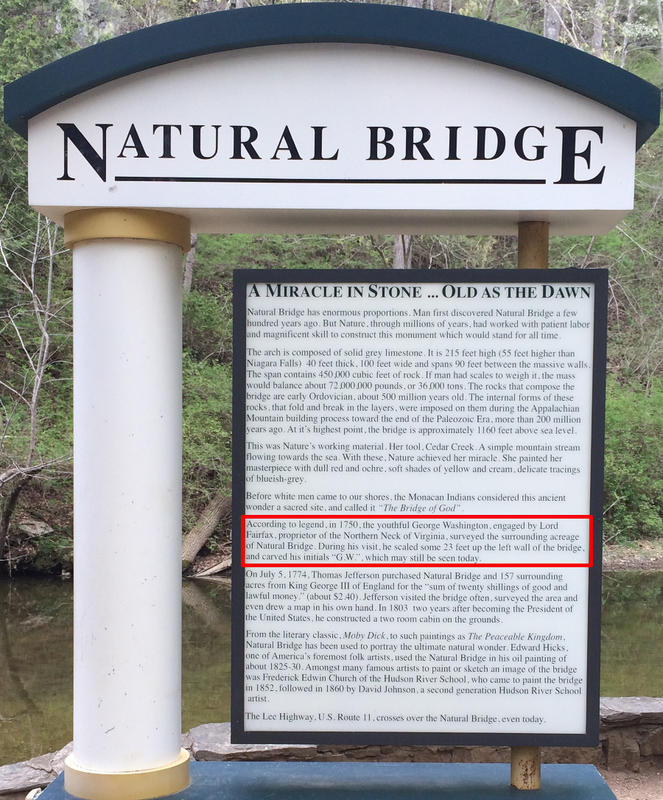 The Virginia Department of Transportation does not consider the natural stone arch to be a "bridge" that requires regular inspections for safety. The state agency also assumes that even if there are voids in the bridge, it could be structurally sound. 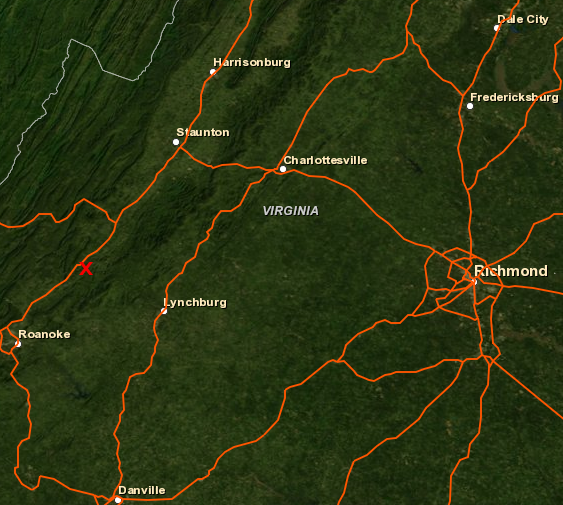 There are other roads in Virginia's karst country that cross unrecognized sinkholes. Since they retain a portion of their cave roof, those natural bridges are still underground, not exposed to view, and not identified as needing regular inspections. In 2017, the Virginia Department of Transportation did agree to use ground penetrating radar to identify if there were any voids in that portion of the bridge underneath Route 11. 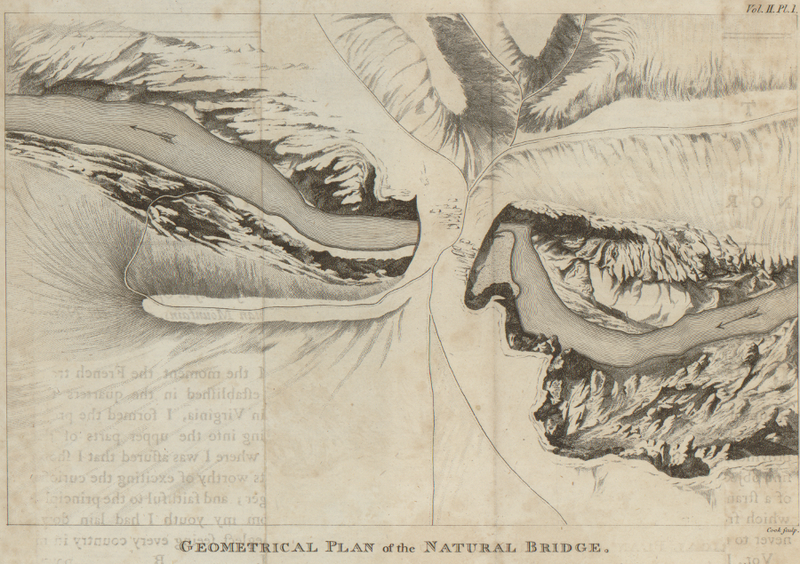 The chief engineer later recommended finding a way to close the bridge to traffic, but based that proposal on the designation of the site as a state park rather than on any data indicating a safety issue. 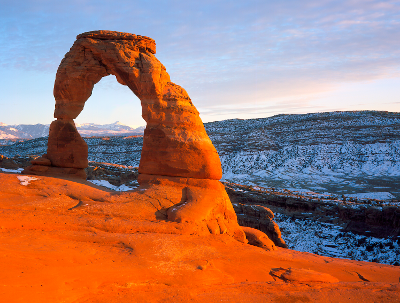 Natural bridges and arches can form through various processes. 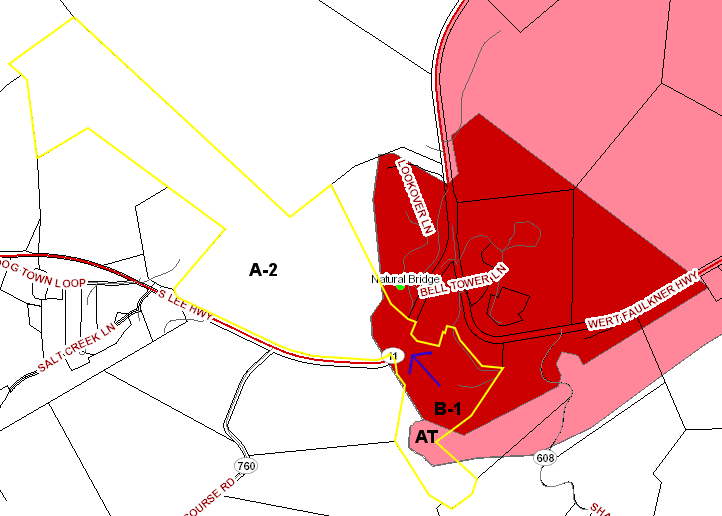 Natural Tunnel in Scott County is an underground channel created by dissolution of limestone. Natural Bridge in Rockbridge County was created by an almost-complete roof collapse when the underground cave/tunnel reached too close to the surface. The other natural bridge in Virginia is located in Lee County near Jonesville. Like the more-famous bridge in Rockbridge County, it was formed by the almost-complete collapse of a cave roof. State Route 622 uses the arch as a bridge to cross Batie Creek, which flows through karst topography. The stream emerges at the base of a 25-foot high cliff of the Martin Creek limestone, at the south edge of The Cedars, and flows to the nearby Powell River. There are two sinkholes between the cliff and State Route 622, showing where the cave roof has already collapsed. 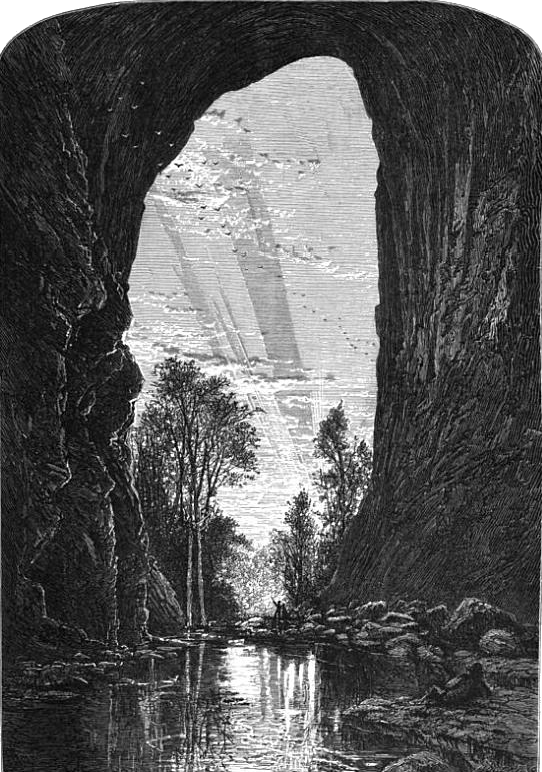 A natural bridge is a type of natural arch where a current of water, such as a stream, clearly was a major agent in the formation of the opening (hole). 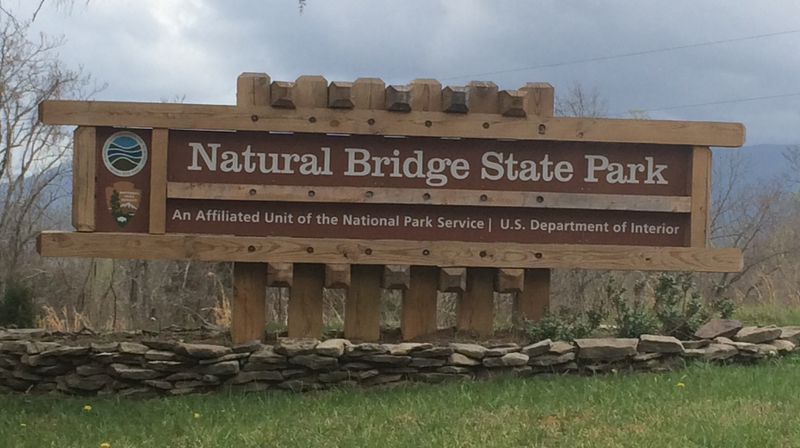 Today, Natural Bridge is primarily a regional tourist destination; travelers on I-81 or I-64 can take a short detour to see the bridge as a side visit. Previously, it was one of the top, nationally-significant attractions in North America, and appears on some lists of the Seven Wonders of the Natural World - before the Grand Canyon, Yellowstone, Yosemite, and other natural wonders were widely known. The Falls of Niagara and Natural Bridge are justly esteemed the most remarkable curiosities in North America... Whatever traveller came to the Western World, to compare its natural grandeur with the grandeur of art and architecture in the countries he had left, went first, in the North, to the Falls of Niagara, and, in the South, to the world-famous bridge. 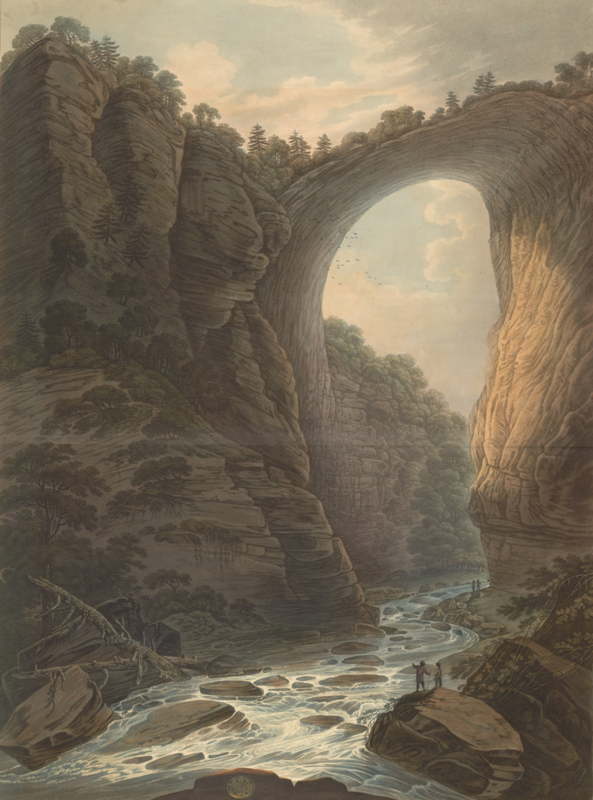 The areas of national significance were incorporated into the system of sites administered by the National Park Service, while Natural Bridge remained a privately-owned tourist attraction. 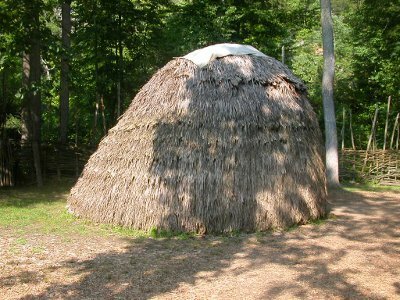 The first housing for visitors was a two-room cabin constructed by Thomas Jefferson. The Forest Inn, built in 1833, provided more accommodations. 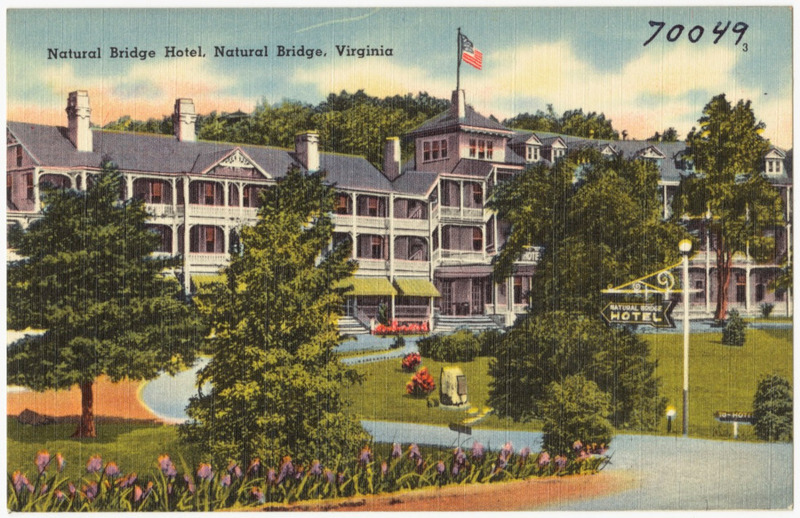 A later "roadhouse hotel" was replaced in 1890 after construction of the impressive Natural Bridge Hotel. 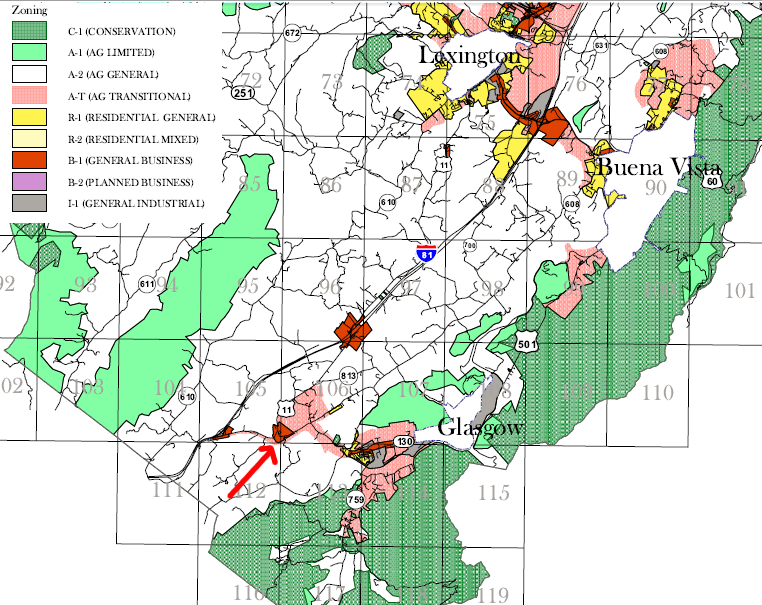 In 2007, the rock arch at Natural Bridge, various associated developments (including a hotel, gift shop, and wax museum attraction), a commercial tour cave (Natural Bridge Caverns), and 1600 acres of surrounding land were advertised for sale. No one offered to meet the $39 million asking price, and the property was taken off the market. 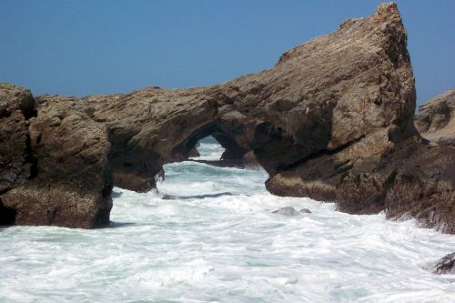 The last time Natural Bridge was owned by a government organization, it was the colonial government led by Lord Dunmore in Williamsburg, before the American Revolution. In 2007 and again in 2013, the private owner tried to get a Federal agency (National Park Service or US Forest Service) or a state agency (Virginia Department of Conservation and Recreation) to purchase the bridge and create a public park. Trying to sell the property during the most significant economic recession since the 1930's, at a time when Congress was gridlocked over budget and debt issues, was hard. Carving out a parcel with just the bridge, excluding the vacant land and commercial properties (except perhaps the gift shop, which could be repurposed as a visitor center...) was considered in order to reduce the cost for a government agency to acquire the site. 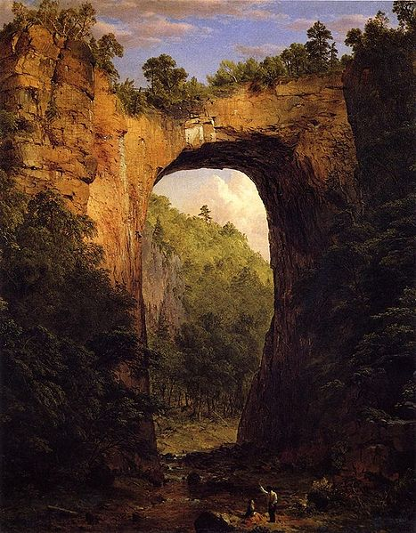 A conservation easement, limiting alterations to the bridge and its setting, was another option for ensure permanent preservation of Natural Bridge. In December 2013, the planned auction of the site was cancelled by the private owner. In 2014 a regional nonprofit group, the Virginia Conservation Legacy Fund, purchased all of the property for just $8.6 million plus an additional $7 million in state tax credits for placing a conservation easement on the property. The site was appraised at $21 million, so the sale was a bargain. The private owner, Angelo Puglisi, was a DC-area real estate developer who had purchased Natural Bridge in 1988 for $6.5 million. Puglisi was hooked on the deal by the connection of the land to Thomas Jefferson, and did not buy it or manage it to maximize revenue. He had never visited the site before a friend encouraged him to buy it. The bargain sale price and the state loan allowed the Virginia Conservation Legacy Fund to reorient the gift shop away from items manufactured in China and to stock the shelves instead with more-authentic, Virginia-crafted products. The new owner also changed management at the sales center selling tickets to visit Natural Bridge. The former staff found new jobs operating the gift shop, restaurant, and other concessions at Mabry Mill on the Blue Ridge Parkway. The financial arrangements collapsed in 2015. The costs of normal repairs, delayed maintenance, and required upgrades of outdated electrical/water/sewage utilities consumed more of the income from operations than the Virginia Conservation Legacy Fund had anticipated. The new private owner claimed it spent $5 million on facility improvements. In addition, pledged gifts were not fulfilled and income from tourist operations was lower-than-expected. 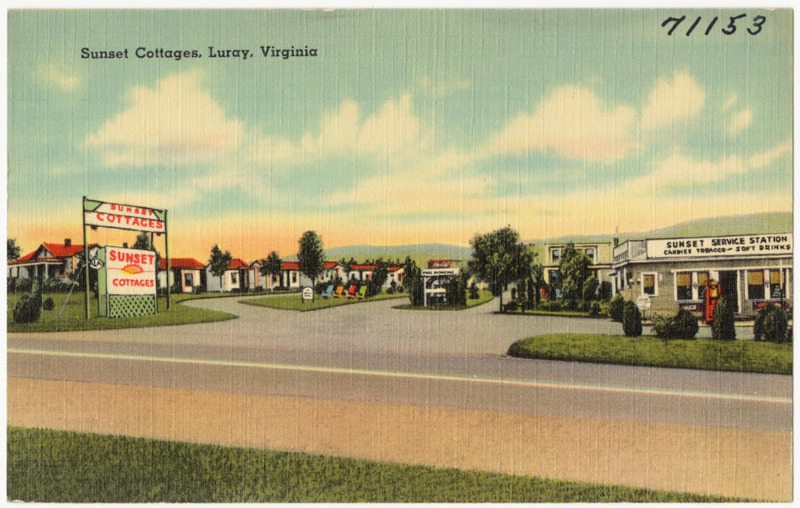 The Virginia Conservation Legacy Fund lacked experience in running a tourist site and hotel, and 2015 visitation declined in part because the Virginia Conservation Legacy Fund had stopped advertising via roadside billboards to attract potential customers driving on nearby I-81 and Route 11. State officials calculated that they could increase visitation from the slightly more than 100,000 in 2015 to 500,000 people in 5 years, and up to 1 million visitors within 10 years. In October, 2015, the private owner repaid the Virginia Resources Authority only half of the annual payment required by the state loan. That failure triggered a late fee and an increase in the loan interest rate, from a subsidized 0.25 percent to a market rate of 7.25 percent. 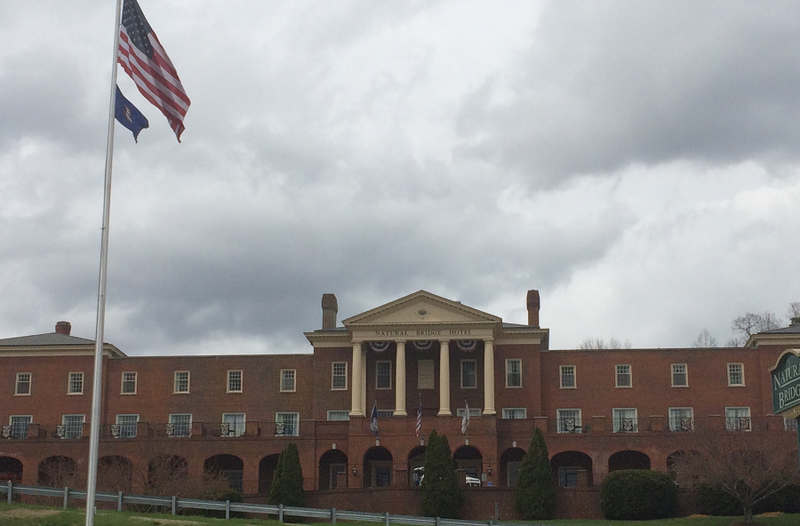 The Virginia Resources Authority had the option to foreclose on the loan. 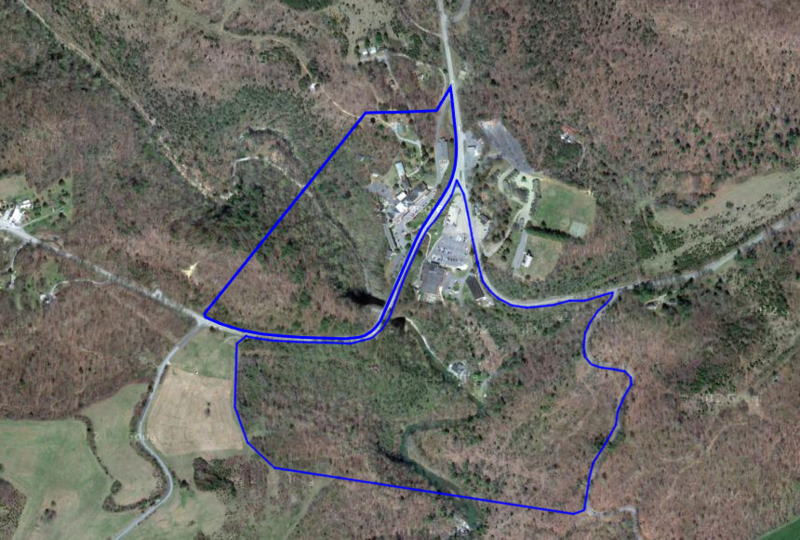 It would have ended up owning the high-maintenance hotel, gift shop, and utility systems as well as Natural Bridge itself, plus 1,500 surrounding acres. Instead, the state agency gave the Virginia Conservation Legacy Fund enough time to assemble new donors and pay the outstanding debt, which was done in February 2016. The debt was also restructured, cutting annual payments in half (to $450,000/year) while doubling the length of the loan period from 10 to 20 years. 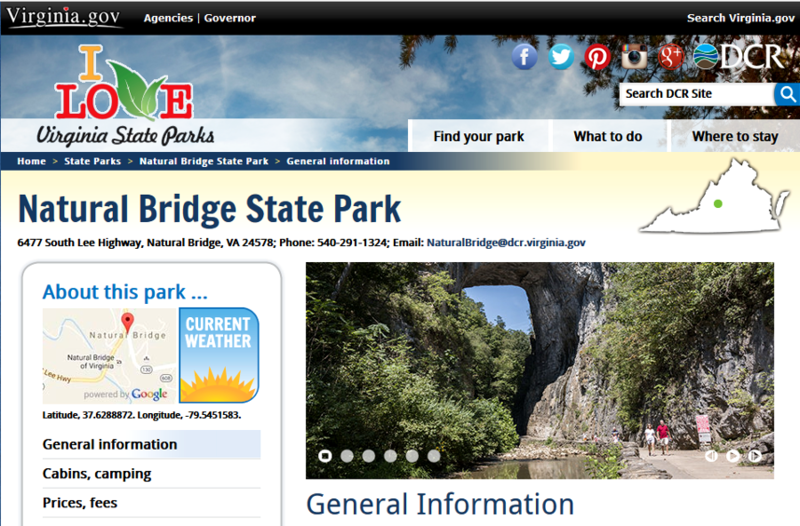 The final deal converted the site into Natural Bridge State Park on September 24, 2016, with park rangers paid by the state. The revenue collected from admission fees and gift shop sales was directed to pay the debt owed by the Virginia Conservation Legacy Fund, which remained owner of the property. If revenue fell short of the annual debt payments, the non-profit organization was obliged to make up the difference.